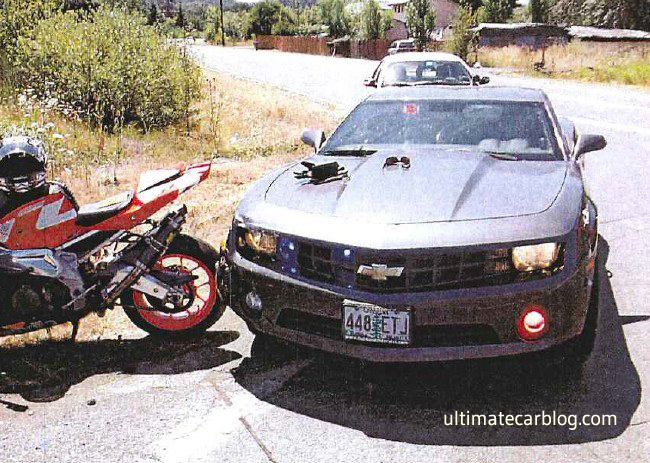 August 3, 2012 – a hot summer day that didn’t turn up to be that good for Justin Wilkens, a motorcyclist who was fast riding his Aprilia on the crowded Crow Road in Eugene, in Oregon and illegally passed at least two cars over a double yellow line. This drew attention to Captain Robert Wayne Edwards, stationed nearby in an unmarked black Camaro police car, with only small red-and-blue police lights but not a siren, who immediately engaged in a three-minute hot pursuit. Thinking that the motorcyclist was feeling guilty and trying to elude him, the police officer waited for an intersection and rammed off Wilkens` bike, even if the motorcyclist`s intention was to pull over after he finally saw the small lights running. As Wilkens later declares in court, he “had never seen a black Camaro cop car before.” And this was because the so called police car looked like a regular civilian car, with the license plate also looking standard. So it was pretty obvious why Wilkens didn’t see the lights on time and didn’t stop. After ramming off his bike, the karate police officer walked towards Wilkens and kicked him in the chest, causing him „a broken clavicle and tractured rib.” After drawing down on him, he pulled the pistol and cuffed him. ”He nearly took my leg off. On a dial clock, twelve o`clock facing forward, he hit me at about 7:30. And when you have your foot on a peg on a motorcycle, that`s about 8:30,” Wilkens also explained. After the unfortunate incident, Wilkens decided to sue the police officer for damages caused to himself and the bike, with all expenses reaching $181,170. And Wilkens` decision to sue the officer was made after the district attorney`s didn`t file charges against the karate cop, but was reprimanded for ”neglecting to report his use of force against Wilkens”. But our story gets even more interesting in court. The state police attorneys tried to convince the jury that the police officer rammed off Wilken`s rear bike because the Camaro couldn`t brake on time due to „brake fade.” Well imagine that. Surely that the jury didn`t believe the bed time story and found the police officer ”negligent” for the incident. If we were to debate the situation a little bit more, there would be certain facts that might need to be accounted for. First would be the biker`s fault for speeding and illegally passing cars over a double yellow line. Second, the officer stated that Wilkens was trying to elude him but confessed that the police car was not properly market, being fitted with just small red-and-blue lights and no siren. Then of course, he childly said that it was not his intention to ram off the bike and that his action was ”in line with state police policies and training.” And let`s not forget one important single evidence that eventually led to the cop`s conviction: he was not aware of the fact that his car`s camera was running. From my point of view, one cause leads to series effects. 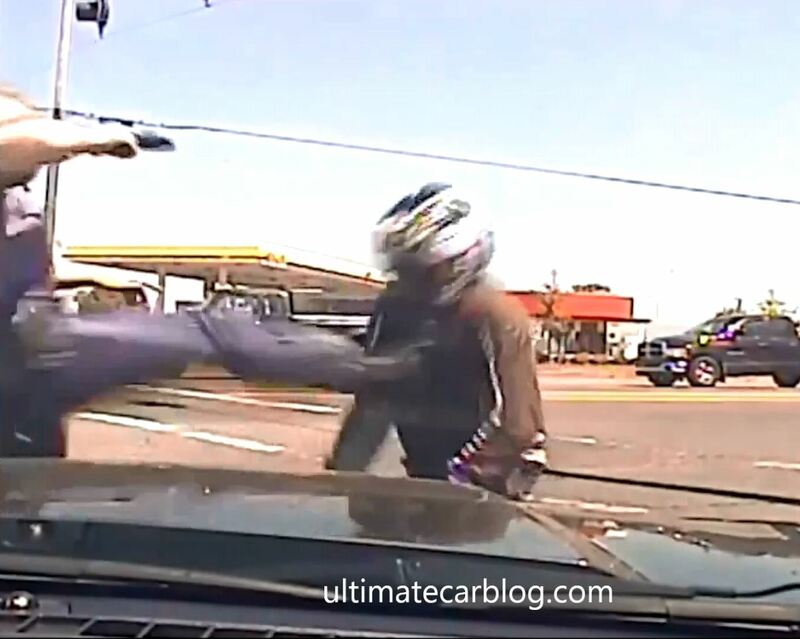 In this case, one single mistake coming from the biker let to an unexpected chain of events. I rest my case. What`s your opinion on this story? Do you think the police officer has to take all the blame, or the biker didn`t really see the Camaro`s lights and wanted to elude the cop? In case you want more time to think, take a look at the entire footage with the chase below!